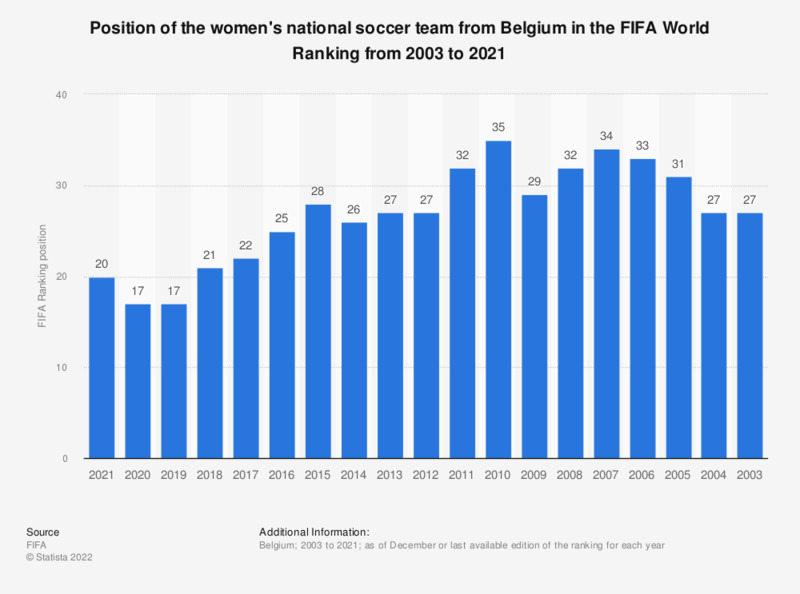 This statistic shows the FIFA World Ranking of the Belgian women's national football team from 2003 to 2018. As of 2018, the Belgian women's national football team was ranked 23rd on the FIFA World raking, one position lower than the year before. The lowest ranking was reached in 2010, when the women's football team of Belgium was ranked on place 35 of the FIFA World ranking. * Since 2003, the FIFA World Ranking is used to rank women's national teams, based on their game results. The most successful team is ranked highest (position 1). Everything On "Professional football in the Netherlands and Belgium" in One Document: Edited and Divided into Handy Chapters. Including Detailed References.